In this tutorial, we will be creating a simple about page that is powered by PHP, HTML5 and CSS3. It will present your contact information to your visitors, with an option for downloading it as a vCard (useful for importing it in third party applications). You can use today's example as a placeholder for your upcoming personal website, or as an actual about page. As always, the first step is to write the HTML markup that will be powering our example. This is a simple page the main purpose of which is to present our contact details semantically. This will require adding appropriate meta tags and using the hCard microformat to embed data in the page. The $profile variable you see above, holds an object of the AboutPage PHP class that we will be writing in a moment. It holds our contact details and provides a number of useful methods for generating JSON and vCard files. You can also optionally specify a home / work address and other kinds of useful information. One of the points of using a server side language is that we can leave some aspects of the page to be generated on the fly. This frees us from having to manually keep various parts of the page up to date. In the case with our about page, we have a simple configuration file, which holds the data, used by the page. This same resource is used for the generation of the vCard file and the JSON feed. Not all of these properties are presented on the about page. Some of them (like the address fields, company, email and birthday) are only made available when the user downloads the profile as a vCard or as a JSON file. You can also add quite a few more properties to this array (a complete list is given as a comment in the config.php file). So now that we have provided all the information we wanted, we need to build a class that will handle the task of presenting a complete about page. As you can see from the code below, we are using a third party open source class for the actual generation of the vCard file (vcf). As this class uses its own set of method calls, we will need to transform our configuration file to something that it will understand. We are doing this with the $propertyMap array which maps properties found in our $info array to the names of method calls that will need to be executed on the vCard object. After we configure the $vcard object, we set the content headers and call the object's generateCardOutput() method. This causes the browser to display a file download dialog. We are doing basically the same thing in the generateJSON method, with the worthy exception that we are not using a third party PHP class, but the json_encode() built-in. We are serving the JSON file with an application/json content type. You can also uncomment the access control header if you wish to be able to access your data via AJAX from other domains. The fragment you see above is found at the top of index.php, before any of the HTML, as we have to be able to set headers. After including the appropriate PHP source files, we create a new AboutPage object with the configuration array as its parameter. After this we check whether the requested URL is ?json or ?vcard, and serve the appropriate data. Otherwise, the regular about page is displayed. The code above applies a CSS3 linear gradient to the button, text shadows and rounded corners. It also defines a 0.25 sec transition, that animates the glow that is applied on hover. We are also using the :before pseudo element to create the icon that goes with the button. As we are using a sprite, the only thing that differs between the two buttons is the offset of the background image. As the #links section element contains more than these links (it contains a paragraph with a link to a great portrait image by Levy Carneiro Jr.) , we have to limit the styling to the anchor elements that are direct children of the section. With this our PHP & CSS3 powered about page is complete! 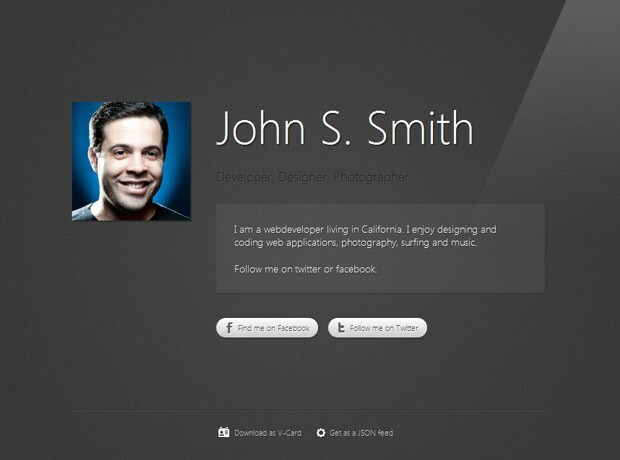 You can use this about page as a simple placeholder for your personal website. You can also use an existing users database and create beautiful profiles for your users. Combined with some of our previous tutorials, you can display your latest posts on facebook, flickr images or tweets as a personalized home page. Interesting way for this especially including the vCard! This is a very awesome tut. I just tried to use it but unfortunately I had some problem. I was continually getting the HTTP Error 500. and now when I checked the error log it says "PHP Fatal error: Multiple access type modifiers are not allowed in /var/www/includes/vcard.class.php on line 65". I have no idea how to fix this. Can you help me please? Sarmad, you can re-download the demo archive. This was an issue that is now fixed. Thank you for catching that. I have no idea how it got in the download archive. Fixed. i really like the vcard functionality, its really helpful.